Although everybody is convinced about the high potential of internet growth in India, ground reality seems to be different. Yes, India recently crossed the 100 million internet users marks, but the speed of browsing is still painstakingly slow! There have been reports over past couple of years that Indian Govt. is pushing hard to increase Internet penetration and the average internet speed that consumers get, but it has made little difference to ground realities. Akamai, one of the leading cloud platforms released their quarterly report on “State of Internet”. According to the numbers released, India has improved compared to previous quarter, but in larger scheme of things the numbers are very disappointing. 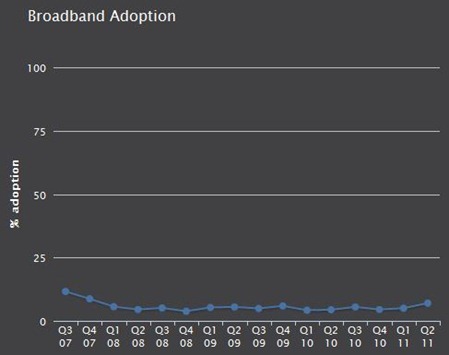 The percentage of broadband connections (connections to Akamai at speeds above 2 Mbps) grew at 45% quarter over quarter. If you are feeling good reading points 1 and 3, hold on – Look at the graphic given below. 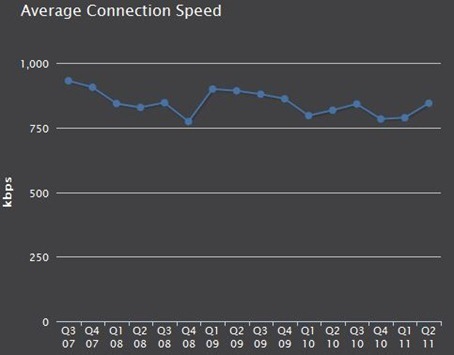 If you compare average connection speeds over last 4 years, you will see that we had average connection speeds of over 900 kbps in 2007, while currently we have a average internet speeds of about 844 kbps. Instead of improving significantly, we have gone further down. One of the reasons, I think, is because large percentage of Indian population now accesses internet on their mobile, which offer extremely low speeds. The improvement in speeds in last quarter has come about probably due to higher speeds now available on 3G. Overall, I can safely say that India has not witnessed any major improvement in average internet speeds! Again, the trend is similar – although we have improved significantly over last quarter (from 5% to 7%), compared to 4 years back we are still lower. In 2007, India had a broadband adoption rate of over 11% compared to today’s 7%. While on the other hand, instead of decreasing, India’s narrowband adoption rate is higher than what it was 4 years back! Globally, India ranks 112th when it comes internet speeds. 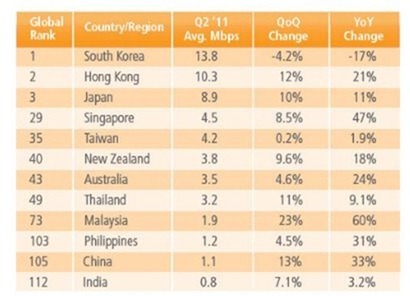 Even Asian countries like Malaysia and Thailand have 4 times faster internet speeds than India. Just having 100 million users if not enough, better and faster internet connectivity is equally important to exploit the benefits of internet! Majority of the high speed connections above 512 kbps are limited, limited to the point it doesnt make any sense to have such speeds like a 4mbps 2gb limit connection. So the average speed here cannot be compared to that of Korea or france, where they have mostly unlimited connections or limits upwards of 100gb per month. The average unlimited connection in my opinion would be slightly above 300 kbps, at best. Only 7! I don’t think so. When there are 100 million users in India then how only 7% use broadband. May be people have switched to 3G from broadband but it is still costlier than broadband. n u still think Chrome Books will be hit in India?